QUETTA: Terror reared its ugly head once again in Balochistan where 21 people were martyred and dozens of others injured on Friday in two separate attacks that took place in the provincial capital and the border town of Chaman respectively. According to police and Balochistan Home Minister Zia Langove, the vegetable vendors belonging to the ethnic Hazara community were the target. “A suicide bomber detonated his explosive laden vest inside the vegetable market,” said Langove. Body parts littered the scene and injured people screamed for help as smoke cloaked the market after the explosion. A heavy contingent of law enforcement agencies and rescue workers rushed to the scene and shifted the bodies and the injured to Civil Hospital and Bolan Medical Complex. Langove said five critically injured were being treated at the Civil Hospital’s Trauma Centre. Hazara vegetable vendors are escorted by security forces when they travel to Hazar Ganji Market as the community has been facing sectarian violence for over a decade. 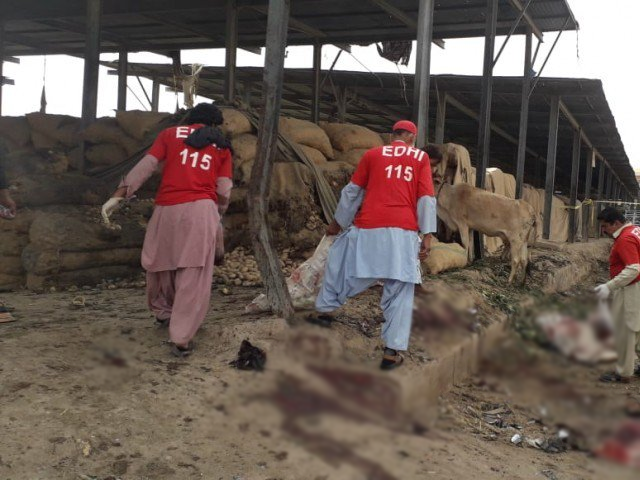 DIG Quetta Abdul Razzaq Cheema said the FC, police and Eagle Squad were escorting 11 vehicles and 55 members of the Hazara community when they left for the market. Irfan Khan, an injured labourer, told AFP that he was loading a small truck when he heard a huge bang. “It seemed as if the earth beneath me had shaken and I fell down. The atmosphere was filled with black smoke and I could not see anything, I could hear people screaming for help and I was also screaming for help.” He said the air was “filled with the stinging smell of burnt human flesh”. According to AFP, a faction of the Tehreek-e-Taliban Pakistan claimed the attack. The group said it collaborated with Lashkar-e-Jhangvi (LeJ), which has been behind numerous bloody attacks on the Hazara community in Pakistan. There was no immediate confirmation from the LeJ. Balochistan Chief Minister Jam Kamal condemned the attack and expressed grief over the loss of lives. “The perpetrators of today’s attack won’t be spared. Security forces will respond sternly against terrorist groups targeting innocent citizens,” Kamal said. He directed the health department to ensure proper treatment of the injured. Kamal also chaired a meeting following the attack. It was announced later that action would be stepped up against armed groups and their hideouts in Balochistan. Provincial ministers Langove, Meer Naseebullah Marri and Sardar Abdul Rehman Kethran, advisers Khaliq Hazara, Muhammad Khan Lehri and Asghar Khan Achakzai, the Balochistan chief secretary, the IGP and the DIG Quetta were present in the meeting. The provincial government also announced compensation for the martyrs and the injured victims. It said it would bear the expenses of the medical treatment of the injured. After the blast, a protest erupted at Quetta’s western by-pass and people set tyres on fire as they blocked the road for traffic. Members of the Hazara community, including women and children, also walked through the provincial capital’s streets and later staged a protest in front of the Quetta Press Club. They demanded immediate action against the elements involved in the attack and called for implementing the National Action Plan without any discrimination. They said it was the responsibility of the state to provide security to the people. All eight members of the Hazara community were laid to rest at the Hazara Town graveyard in the presence of thousands of people in the evening. Langove and Health Minister Mir Nasibullah Marri participated in the funeral. Other victims were also buried in different areas of the city. The bodies of some of the victims were sent to their native towns. 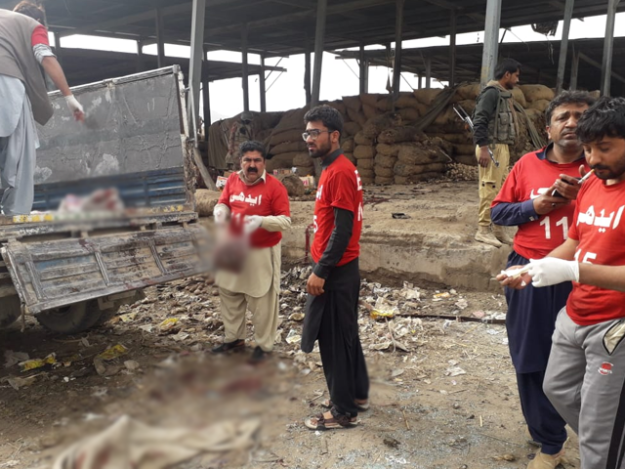 Terrorists also targeted a busy market in the border town of Chaman using an improvised explosive device, martyring one man and injuring 11 others including two FC personnel. Police said unidentified terrorists had planted a remote controlled device to target an FC convoy. The device was planted inside a motorcycle which exploded as an FC’s convoy was passing through the area, said an official. Three vehicles, eight motorbikes and nearby buildings were also damaged in the blast. The forces cordoned off the area as a fire brigade unit doused the fire ignited by the explosion. Security forces and rescue workers shifted the injured to the district headquarters hospital, where an emergency was announced. Some of the injured were admitted to the hospital in a critical condition, said rescue sources. Mall Road and Trench Road were closed for all traffic following the attack. President Dr. Arif Alvi has expressed his deep sense of shock and sorrow at the loss of precious lives in Quetta blast. He said that it was heinous act of terrorism, which is a reminder for us as nation that few remnants of this menace are still left to be eliminated totally. Another cowardly act of targeting the innocent citizen. I strongly condemn this pointless act of terror, responsible shall not be spared, InSha'Allah. My prayers for the shuhadah and their families. Condemn the terrorist attack in #Quetta. The government must stop dragging its feet & take action to counter violent extremism. Thoughts and prayers with the families of the victims. Pakistan Tehreek-e-Insaf (PTI), PML-N expressed grief in a tweet.